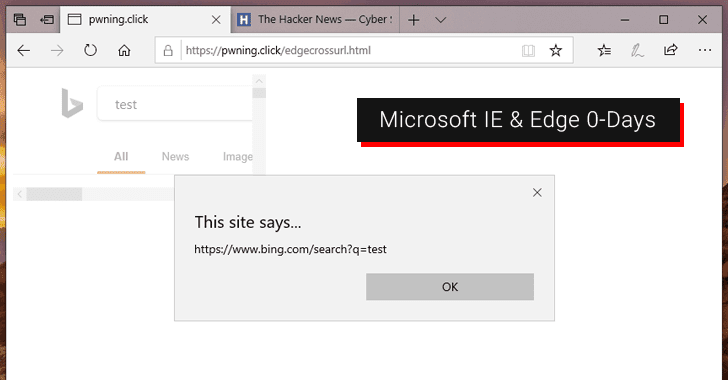 Both unpatched vulnerabilities—one of which affects the latest version of Microsoft Internet Explorer and another affects the latest Edge Browser—allow a remote attacker to bypass same-origin policy on victim's web browser. However, the vulnerabilities discovered by 20-year-old security researcher James Lee, who shared the details with The Hacker News, could allow a malicious website to perform universal cross-site scripting (UXSS) attacks against any domain visited using the vulnerable Microsoft's web browsers. To successfully exploit these vulnerabilities, all attackers need to do is convince a victim into opening the malicious website [created by hacker], eventually allowing them to steal victim's sensitive data, like login session and cookies, from other sites visited on the same browser. Since the details and PoC for both the zero-days have already been made publicly available, hackers won't take much time to exploit the flaws in an attempt to target Microsoft users. What's disappointing is that there is currently not much that users can do to avoid this problem until Microsoft patches the security issues. You can use other web browsers that are not affected by this vulnerability, such as Chrome or Firefox.